We have manually labeled each image in the UC-Merced archive with one or more (maximum seven) labels based on visual inspection in order to create the ground reference data. The total number of distinct class labels associated for the considered archive is 17. Download the Labels from here. For the details see our paper. 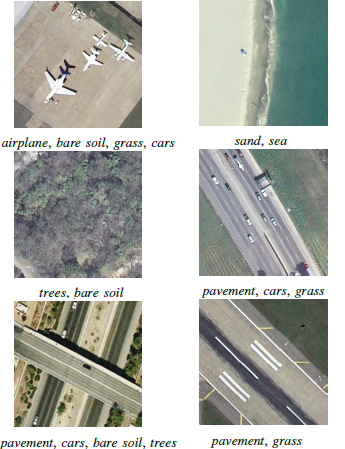 B. Chaudhuri, B. Demir, S. Chaudhuri, L. Bruzzone, "Multi-label Remote Sensing Image Retrieval using a Semi-Supervised Graph-Theoretic Method", IEEE Transactions on Geoscience and Remote Sensing, vol. 56, no.1, 2018. 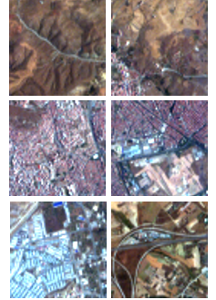 The Ankara benchmark archive consists of 216 hyperspectral image tiles obtained by fragmenting a hyperspectral image acquired by EO-1 Hyperion sensor over surroundings of Ankara, Turkey. Each image tile has been annotated with: i) multiple land-cover class labels and ii) a land-use category label. Download the archive from here. For the details see Readme file and also our paper. F. Ömrüuzun, B. Demir, L. Bruzzone and Y. Y. Çetin, "Content based hyperspectral image retrieval using bag of endmembers image descriptors," 8th Workshop on Hyperspectral Image and Signal Processing: Evolution in Remote Sensing (WHISPERS), Los Angeles, CA, 2016, pp. 1-4.